We did it. We’re 4 for 4 on dresses. Nobody pooped in the sink or got sick from Indian Food. I must say I underestimated the complexity of finding dresses for my BM’s. Ok, so I knew I certainly wasn’t making things easy for myself. Less than 80 days until the wedding. One BM is in Baton Rouge, LA. 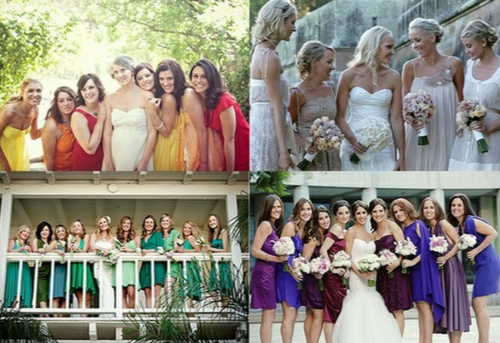 Blah, blah, blah….oh, and I wanted each girl to have a different dress in a different color. I figured we could just find each girl a dress in a store at the mall. Not so much. 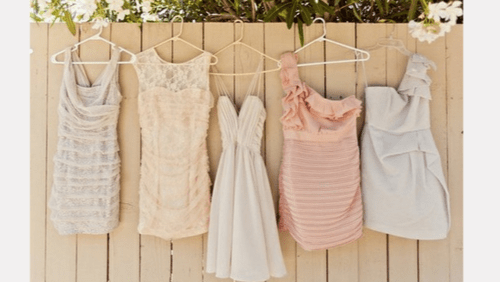 We covered the entire mall looking for pretty dresses in soft solid colors – um, no. We found neon, bold prints, and satin. Gross. We also found that Nordstrom now offers a bridal service. Score. And we found that dresses are in stock and can arrive within 3 – 8 business days. Double score. We chose two styles and colors that we really liked. 2 down, 2 to go. We ventured to Alfred Angelo (holler, PROM) but it was a total bust. They had nothing we liked, and wouldn’t even rush the dresses if we didn’t order that day. Boo. A quick Google search told us there was a David’s Bridal a few blocks away, so we made the venture. After some super serious puzzle work (no, serious) since they don’t make every dress style in every color in every size – we really had to game plan it out. Like, to the point of brain numbing exhaustion…thank baby Jesus I had 3 smarty-pants BM’s with me. We thought we locked two dresses at David’s Bridal – but we weren’t able to order one of them. No worries – the dress showed up as available in the system – we just needed to call and order it during East Coast Business hours the next day. The next day we find out the dress isn’t available and we needed to find one more dress. Back to Nordstroms for the final dress – ordered online and done! And that is the saga of the dresses. End scene.